Our new Bishop will be president of the London Diocesan Board for Schools. 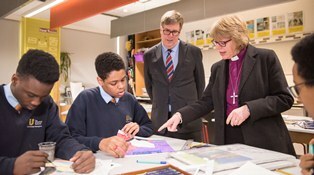 The Urswick School in Hackney was thrilled to host her for an introductory visit on the same day that Bishop Sarah’s appointment was announced. Everyone at the Board for Schools and in all our wide ranging family of schools look forward to welcoming Bishop Sarah as we continue the work of providing education which is deeply Christian, characterised by wisdom, community, hope and dignity.